Bettendorf Heating & Cooling serves LeClaire, IA, with a full spectrum of HVAC services. Our air conditioning repair technicians are licensed and certified to maintain any make and model residential unit. Our service is affordable and reliable. Before the heat of summer strikes LeClaire, be sure to have your AC unit inspected and maintained by our professional technicians. Our prices are affordable and our dedication to our customers is undeniable. Iowa summers can be hot and sticky. Our customers rely on their AC units to keep their homes comfortable and cool. With routine AC maintenance, you can keep your unit operating smoothly. However, this is not always the case and you could need repairs to your unit. Our technicians will inspect each aspect of your unit to look for signs of wear and tear. We typically bring along commonly need parts and supplies so that we can quickly make any repairs during our inspections. 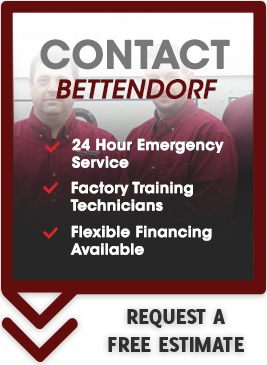 Bettendorf Heating & Cooling features licensed and certified technicians who are experts at what they do. They have experience working on all types of residential AC units and HVAC systems. You can consult with them about everything from new installations to routine tune-upsr. With regular inspections of your AC unit, you can keep it in top-functioning condition. Our technicians will treat your unit just like it was their own. You can rely on their expertise and experience as they maintain your air conditioning system. 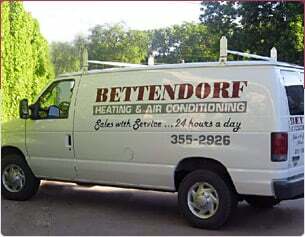 Bettendorf Heating & Cooling provides professional AC repair for LeClaire, IA. We'll schedule an appointment at your convenience. If you discover that your unit is not cooling as it did previously, be sure to contact us to troubleshoot the problem. Repairs can keep your AC unit operating smoothly and ensure that it lasts as long as possible. We look forward to keeping your air conditioning unit working optimally for years to come.